Review the play: Do you think he's guilty? 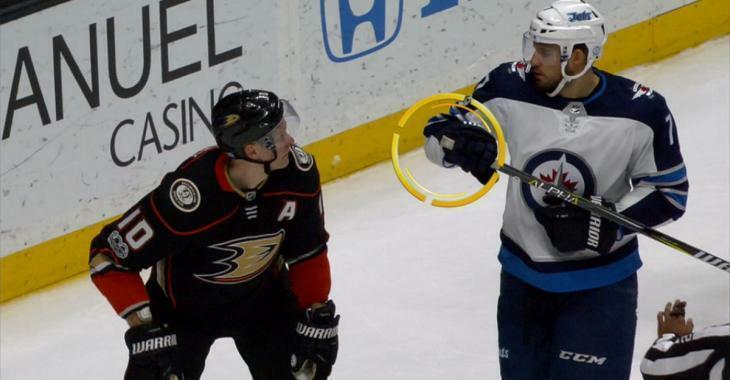 The Anaheim Ducks and Winnipeg Jets squared off Friday night and the Canadian club added insult to injury when they won the game and nailed Corey Perry in the face with the end of a stick. Here's the incident in question. Seemingly not a huge deal - but the play is malicious in intent and there's talk of a possible suspension for the aggressor. Mike Johnson of TSN believes he will be suspended due to the aggressive, careless, and dangerous nature of the act. "I think it should be 1 or 2 games." "I think this is a 2 game suspension - careless use of the stick," added Craig Button. What do you think? Does he deserve to get suspended?